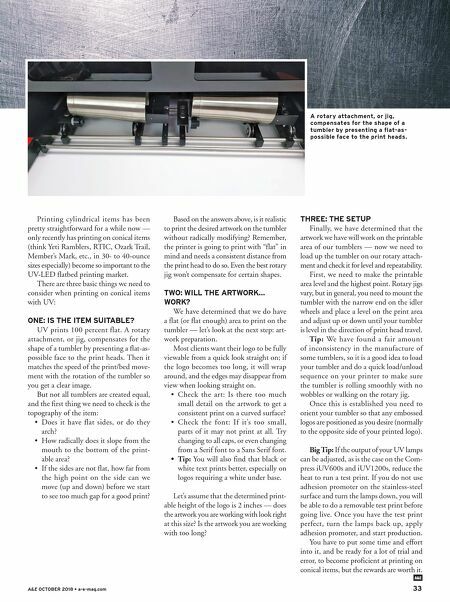 32 a-e-mag.com • A&E OCTOBER 2018 Over the past couple of years, we have seen an explosion in the number of UV-LED flatbed printers used for personal- ization and recognition. The demand in the U.S. for stainless-steel tumblers and water bottles has skyrocketed. Current growth projections show the stainless-steel tum- bler market is set to exceed $1 billion by 2023 with a growth rate of 8-plus percent expected annually. Not only that, but the largest segment of that growth will be in customization for giveaways and promo- tional items. Looking at the confluence of these two trends, I wanted to share some techniques and tips for getting quality prints on stain- less-steel tumblers and other conical-shaped water bottles and promo items with your flatbed UV printer. Don Copeland is a pioneer in the decorated apparel industry and is currently the Product Manager for the Compress brand product line for ColDesi Inc. He brings 27 years' worth of digital printing experience to the DTG and Compress brands. Don has been instrumental in the devel- opment of direct-to-garment machines to the industry back in 2004 as well as many other accomplishments. 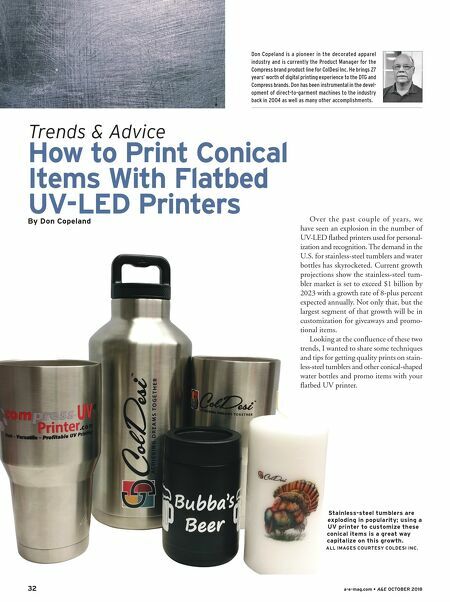 By Don Copeland How to Print Conical Items With Flatbed UV-LED Printers Trends & Advice Stainless-steel tumblers are exploding in popularity; using a UV printer to customize these conical items is a great way capitalize on this growth. ALL IMAGES COURTESY COLDESI INC.